Amazon is really bad at informing you whether or not you're going to have to pay for digital downloads, but they're really good at apologizing for how terrible they are at it. I've had a $10 credit toward Amazon's game download store listed on the site for a year, and now their digital downloads work through Steam which is totally awesome, and Dungeon Defenders was on sale and it looked mildly interesting, so I decided to buy that with my $10 credit. 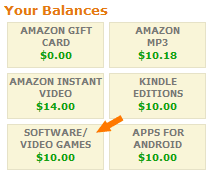 The checkout page listed "gift certificate / Visa" as the payment option (Curse.com pays me in Amazon credit so I constantly have gift cards applied to my account), so I figured yeah, totally, that $10 credit toward game downloads must be working. Nope. The full price was charged to my credit card. I had already put my activation code into Steam and installed the game at that point too, so no hope of a refund. So I contacted their customer service. The woman apologized and said that that $10 credit was only good for Xbox Live subscriptions. WTF. Oh, duh, I totally should have been able to tell that from the "Your Balances" screen, which from what I can tell is the only place where you can see your store credit for downloadable products, and is only accessible from the pages for MP3 albums. So yes, obviously that is just for Xbox Live subscriptions. My mistake. But she was nice and refunded my credit card. And I get to keep the game. And I'm not sure exactly what she did because there's no place that lists your various promotions, but apparently she converted that $10 credit for an Xbox Live subscription into a $10 credit for any digital download, because all of the other numbers other than software / video games and gift card just increased by 10. WHAT IS GOING ON? Is this what it feels like to be the annoying customer who gets free stuff just so the customer service rep doesn't have to deal with you anymore? Because it's half frustrating and half awesome.